Type Port Injected 4 cyl. Type Fuel Injection 4 cyl. Type Fuel Injection 8 cyl. Type Port Injected 8 cyl. The Victor Direct Port Nitrous Kit is an entry level kit designed for street/strip and competition. This kit features high-quality components with your choice of either Edelbrock E1 or Edelbrock/Glidden E2 stainless steel nitrous nozzles. Match with an Edelbrock Bottle Kit for maximum race-level performance with the bottle/bracket combination you want. Victor Kits include Edelbrock Performer solenoids and stainless jetting, precision CNC machined billet distribution blocks, plus all necessary fittings and electrical components for unmatched durability and quality. Our most sophisticated nitrous system allows you to tune each individual cylinder for superior performance! Utilizing your choice of either Edelbrock E1, Edelbrock/Glidden E2 stainless steel, or E3 “Straight-Shot” titanium nitrous nozzles, this is a direct port kit designed for serious competition with power increases of 200-500+ hp (V8 kits). They include Victor Pro Bottom Exit nitrous solenoids and Victor Pro fuel solenoids for improved flow characteristics. Match with an Edelbrock Bottle Kit for maximum race-level performance with the bottle/bracket combination you want. V8 kits include 56 stainless steel jets, 8 each of 7 sizes. Four cylinder kits include 28 jets, 4 each of 7 sizes. Utilizing E3 “Straight-Shot” titanium nitrous nozzles, this is a direct port kit designed for racers who want a custom system utilizing their own jet map for horsepower increases up to 500 or more. It includes two Victor Pro nitrous solenoids and two Performer fuel solenoids. 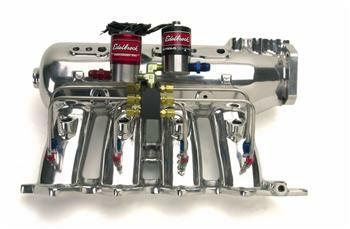 Match with an Edelbrock Bottle Kit for maximum race-level performance with the bottle/bracket combination you want. Jets not supplied, consult your nitrous expert for recommendations.